Created by marine microorganisms, each piece of coral has its own unique character. In Scotland, there is a saying that coral brings beauty and prosperity to young girls. Coral is neither plant nor mineral, but rather a product of microorganisms that live in the ocean. It is composed mainly of calcium carbonate-the same as the outer portion of pearls- and forms slowly over time in nature, with no human intervention. It has long been said that coral has the power to protect one from evil spirits and to bring good fortune, and it was used extensively during the ancient Greek and Roman ages. The deep red coral from the Mediterranean Sea was introduced to Japan via the Silk Road during the Nara Period (710-784AD) and is still called kowatari (literally, "through Persia") there. 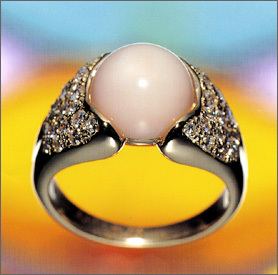 The photograph below shows a ring with a beautiful pink coral, measuring 9 millimeters (0.35 inch) in diameter, set with high-quality diamonds to either side. The necklace to the next page is comprised of beautiful pieces with very even color and very few cracks or fractures. The gathering of gem coral began with drag-netting, which was replaced by diving around the middle of the 20th century. Today, robots are being used on deep ocean floors, and the environment is protected as the coral is gathered. The Washington Treaty regulates the harvest of hexacorallia coral (soft coral), the type that forms coral reefs, whereas the material used in jewelry is a different variety called octocorallia coral. Black coral is a type of soft coral that is similar to hexacorallia coral. In 1868, a ban on coral fishing in Japan was lifted, and by the 20th century exports to the Mediterranean coral processing center of Torre de Greco in southern Italy flourished. The Japanese had preferred the red Mediterranean coral for many years, but the Italian coral merchants set their sights on the beauty o the light-colored coral that came from Japan. They especially noticed a material that the Japanese called "boke," a light pink color with very even coloration that is now called "angel skin." To keep the prices from rising, the Italians referred to this as "charbo" (faded color), or "insignificante" (boring). One can only praise the deep understanding of beauty and excellent business sense of these Italian merchants. Coral is easily attacked by acid such as lemon juice and vinegar, and some pieces are specially processed to protect their surfaces. Also, since coral's hardness is low at 3 1/2, it should be stored separately from other gemstones. The secret to preserving coral's beauty is to wipe it with a soft cloth after each use.